This Sunday, the SIMM Music Series continues with a stellar line-up: “The Josh Allen Trio” featuring the amazing guitarist Henry Kaiser, saxophonist Josh Allen, drummer Mike Guarino and the group Forward Energy, featuring Jim Ryan on alto & tenor sax, flute, trumpet, Outsound and Edgetone Record’s founder Rent Romus on alto, soprano, & C melody saxes, Scott R. Looney on piano, Eric Marshall double bass and Timothy Orr on drums. This show is guaranteed to challenge the senses and push the musical envelope in ways rarely heard seen or heard. Guitarist Henry Kaiser is a modern guitar icon, known for his collaboration with the Grateful Dead, among many others, as well as his own prolific and inventive compositions. Kaiser has helped unfetter the guitar from the conventions of genre-bound techniques, but his instrumental virtuosity and technological breakthroughs are always deployed in the service of deep and immediate personal expression. Likewise, he has developed a highly individual, inimitable style from an uncommonly varied range of influences. 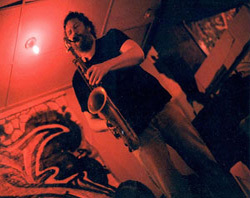 Some of his musical sources include traditional blues, East Asian, Classical North Indian and Hawaiian music, free jazz, free improvisation, American steel-string concert guitar, and 20th century classical, but like any probing artist he also draws creatively from other abiding interests, which for Mr. Kaiser include Information Theory, experimental cinema, mathematics, experimental literature and SCUBA diving. (He was employed for the last 15 years as a senior instructor in Underwater Scientific Research at the University of California at Berkeley. Sadly, Berkeley’s excellent scientific diving program was terminated in the summer of 1996.) Kaiser’s fabulous “Yo Miles” project with trumpeter Wadada Leo Smith has been perhaps one of the most ambitious and successful interpretations of the music of Miles Davis from the 1970s.